When financial advisors and providers advertise their services, they hope to reach an audience of affluent investors who are looking for a new advisor or perhaps finally deciding they need an advisor for the first time. But advertising services to the broad band of affluent investors in the United States is an uncertain exercise. Thanks to the internet, investors can gather information on their own or can access dozens if not hundreds of websites that offer recommendations, advice, and investment news of the day. Rather than take a scattershot approach to advertising, financial advisors and providers look to Spectrem’s research to determine the best types of news media to utilize in introducing themselves or reminding investors of the services they provide and the results they get. In The Wealthiest Americans, Spectrem asked investors with a net worth of $25 million or more where they obtain information and news about investments. 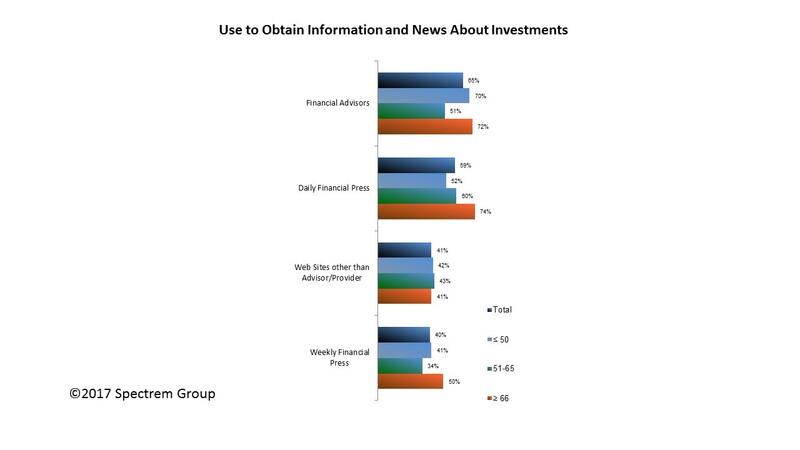 The study discovered not only where the information is retrieved, but which segment of wealthy investors use which types of media outlets to inform themselves of what is going on in the investment world. “Although many people want to suggest that electronic media has killed the print media business, our research shows that investors of all ages are still reading financial newspapers and magazines, even if they are doing so electronically,’’ said Spectrem president George H. Walper Jr. Skeptics will be surprised to learn that 59 percent of investors with a net worth over $25 million read the daily financial press (Wall Street Journal, the Financial Times, etc.) to obtain financial information. That includes more than half of those under the age of 50, and 74 percent of those over the age of 65. Forty percent of wealthy investors also read the weekly financial press, which includes magazines and other news outlets that publish weekly. Those publications tend to provide more in-depth coverage of events occurring within the financial sphere. To be sure, affluent investors are getting much of their financial information from websites and cable television shows that focus on the world’s financial markets. Thirty-five percent of investors with a net worth over $25 million watch cable news shows for information, and that includes a whopping 52 percent of the wealthiest Americans over the age of 65. Cable news shows thrive on advertising, and firms spend a great deal of money to reach the audience of those programs through commercials and sponsorships. It is likely that investors who are searching for investment advice would consider it a recommendation of sorts if they saw an advertisement for a financial provider on their favorite cable news program. The Spectrem study includes one important detail related to the information-gathering of affluent investors. They are more likely to look to their own financial advisors for information, either directly (65 percent of investors do that) or on the advisor or provider’s website (38 percent go there). In both cases, younger investors are more likely to obtain information directly from their advisor than they do from sources they do not have personal relationships with. Another insight from The Wealthiest Americans is that investors with great wealth are using social media far more than investors with lesser wealth. In the case of Twitter and YouTube, usage among the $25 million plus investors is well above the average among all affluent investors. Advertising dollars are only well-spent if they reach the intended audience. The wealthiest investors are likely to have unique habits in terms of information gathering, and advisors and providers would be well-served to understand those differences. The Spectrem study provides that information, but advisors would also benefit from asking their wealthier clients where they learn about investment trends, products and services on a daily basis. The landscape of information dissemination changes every single day, and there are new players in the marketplace constantly. Firms need to have someone who can keep a watchful eye on the media market to make sure they are accessing the proper channels to reach their preferred audience.